Japanese bakeries make amazing pastries. One of the things I discovered while I was there years ago was melon pan. Pan is the Japanese word for bread, which was borrowed from Portuguese language when bread was introduced by traders and missionaries in the 1500s. The bread isn’t flavored like melon – rather, it’s called melon pan because it looks like a melon due to its round shape and scoring pattern. In the Midwest, I’ve only ever seen things like melon pan in Japanese bakeries, although I must admit I haven’t looked too hard for them. What exactly is melon pan? It’s a soft, sweet yeast roll topped with cookie dough before baking. I didn’t realize until recently that there was a separate cookie topping on it – that’s one more mystery of my life, solved. 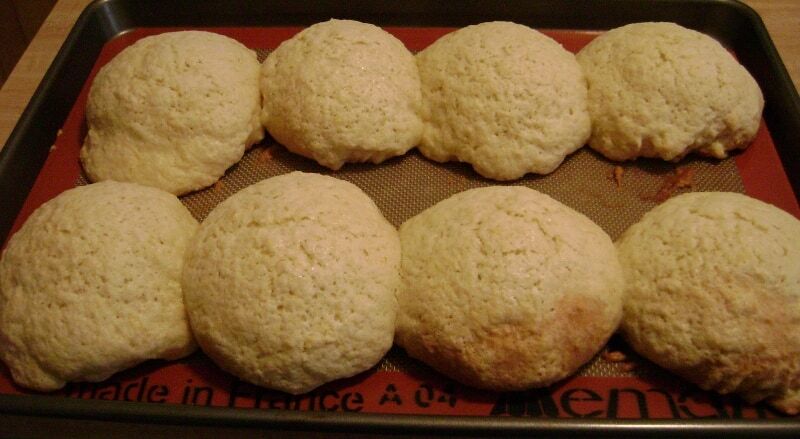 If I’d realized that melon pan was just a roll topped with a cookie, I would have made them long before now! I fell in love with melon pan, and in addition to being delicious, it always brings back good memories of my time spent abroad. Thus I was particularly excited when the King Arthur Flour blog wrote about the recipe for Lemon Sugar Crunch Buns, which are essentially melon pan. I had to make them. First, I made the dough in my stand mixer. Not difficult. I dumped in all the ingredients (flour, sugar, yeast, melted butter, warm milk, salt, vanilla, an egg, and some oil because I ran out of butter), mixed it until it formed a dough, and kneaded it for about 5 minutes in the mixer. I set the dough aside in a greased bowl and let rise for an hour, until doubled. However, I had trouble getting my dough to rise. I let my salt come into contact with some of the yeast, which I’ve heard kills it, although I’ve never had trouble doing that before. My yeast was active dry yeast instead of instant yeast which they call for, but again, I haven’t had trouble with that in the past. Although I raise all my dough in the oven, Thursday was simply cold, and that might have slowed down my dough. In any case, once my dough was doubled in size, I divided it into 8 equal-weight pieces and shaped them into balls. Next, you use wet fingers to coat the yeast dough with cookie dough. The recipe suggests 2 tablespoons of dough, but I think you should use a tiny bit more than that because I had a little extra dough at the end (which I then just added back onto the rolls). The water keeps the dough from sticking to you, and helps smooth the dough as you coat the rolls. I spread the dough down the sides, but not completely underneath the roll. To make the roll pretty, you should completely cover the yeast dough, bottom and all. The yeast dough and the cookie dough are about the same color, so eventually you can’t tell where which dough ends, but they bake differently. If you don’t coat the rolls completely, you’ll end up with browned yeast roll toward the bottom, with lighter cookie dough ending above it – not entirely pretty (although still delicious). At this point, you proof the rolls for about 30 minutes, and then bake. Even if my dough proofed how it was supposed to and was fully risen at 30 minutes, this would mean that the bread would be done at 11:30 at night. I decided to put the pan of rolls in the fridge and bake them the next morning. The next day, I pulled the rolls out and let them proof for about 90 minutes before I baked them. They didn’t get full and puffy during that time, but I think they rose a little and I had to bake them anyway. I baked them at 350F for 25 minutes, turning the pan once. They rose dramatically in the oven. I waited about 15 minutes before I ate one. This bread was delicious. 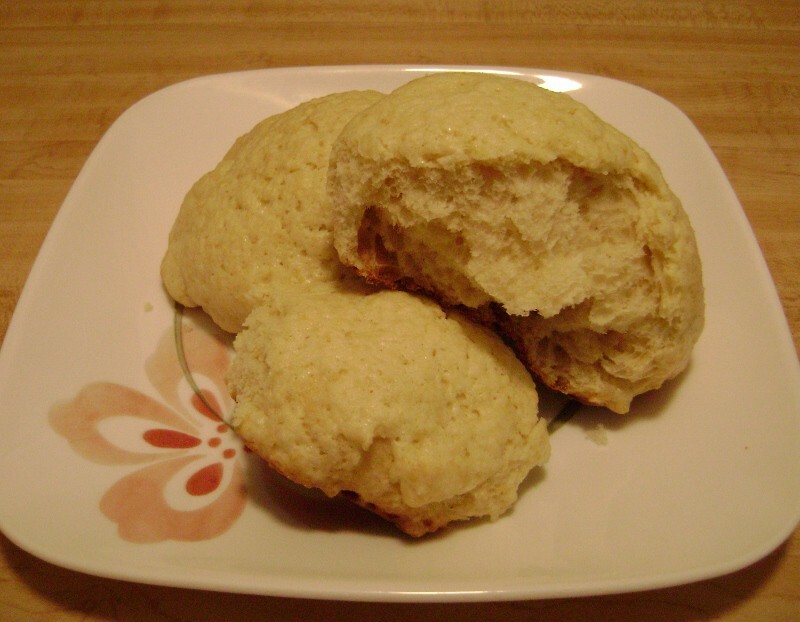 It was exactly like melon pan, a sweet, tender yeast roll topped with crunchy sugar cookie. It was best fresh and warm, like most tender yeast breads, although it was still yummy later. The topping was gently citrusy from the lemon and grapefruit zest. Mine were a little dense, but I think that’s because I had trouble getting my rolls to rise. This was really good, and I would make it again. I may double the vanilla in the yeast dough to make the roll extra flavorful, but they’re also good just as they are.